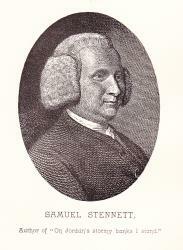 Samuel Stennett was born at Exeter, in 1727. His father was pastor of a Baptist congregation in that city; afterwards of the Baptist Chapel, Little Wild Street, London. In this latter pastorate the son succeeded the father in 1758. He died in 1795. Dr. Stennett was the author of several doctrinal works, and a few hymns. 1. And have I, Christ, no love for Thee? Love for Christ desired. 2. And will the offended God again? The Body the Temple of the Holy Ghost. 3. As on the Cross the Saviour hung. The Thief on the Cross. 4. Behold the leprous Jew. The healing of the Leper. 5. Come, every pious heart. Praise to Christ. 6. Father, at Thy call, I come. Lent. 7. Great God, amid the darksome night. God, a Sun. 8. Great God, what hosts of angels stand. Ministry of Angels. 9. Here at Thy Table, Lord, we meet. Holy Communion. 10. How charming is the place. Public Worship. 11. How shall the sons of men appear? Acceptance through Christ alone. 12. How soft the words my [the] Saviour speaks. Early Piety. 13. How various and how new. Divine Providence. 14. Not all the nobles of the earth. Christians as Sons of God. 15. On Jordan's stormy banks I stand. Heaven anticipated. 16. Prostrate, dear Jesus, at thy feet. Lent. Sometimes, "Dear Saviour, prostrate at Thy feet." 17. Should bounteous nature kindly pour. The greatest of these is Love. From this, "Had I the gift of tongues," st. iii., is taken. 18. Thy counsels of redeeming grace. Holy Scripture. From "Let avarice, from shore to shore." 19. Thy life 1 read, my dearest Lord. Death in Infancy. From this "'Tis Jesus speaks, I fold, says He." 20. 'Tis finished! so the Saviour cried. Good Friday. 21. To Christ, the Lord, let every tongue. Praise of Christ. From this,"Majestic sweetness sits enthroned," st. iii., is taken. 22. To God, my Saviour, and my King. Renewing Grace. 23. To God, the universal King. Praise to God. 24. What wisdom, majesty, and grace. The Gospel. Sometimes, “What majesty and grace." 25. Where two or three with sweet accord. Before the Sermon. 26. Why should a living man complain? Affliction. From this, "Lord, see what floods of sorrow rise," st. iii., is taken. 27. With tears of anguish I lament. Lent. 28. Yonder amazing sight I see. Good Friday.